Donald Trump for President in 2012? 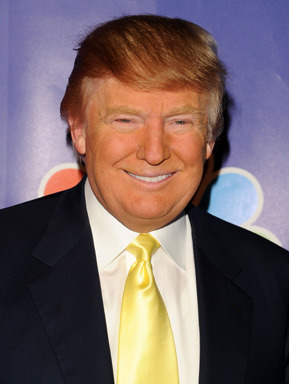 Is Donald Trump considering a 2012 bid to be the Republican presidential nominee? According to Time Magazine, New Hampshire residents were polled in September regarding their thoughts and perceptions about the real estate magnate in relation to a possible presidential bid - but Trump says he had nothing to do with the survey. "I never heard of this poll but I'm anxious to find out what it says. I do not know about a poll taken in New Hampshire," Trump said Monday on CNN's 'American Morning,' adding that he has no plans to run for the Republican nomination. "It's not something I talked about or consider, but somebody has to do something or this country is not going to be a very great country for long," Trump said. The poll, which ran at about 30 questions, tested Trump against potential Republican candidates for 2012 and asked voters if they thought his widespread presence in the media - including on his show, NBC's "The Apprentice" - would help or hurt him in the election. The poll also reportedly asked respondents if they had heard that Trump had ever contributed money to Democrats. Time was not able to determine who paid for the survey, and its results have not been made public. Trump is no stranger to the concept of flirting with a presidential bid: the billionaire has put out feelers in previous election cycles, and considered entering the contest as a Reform Party candidate in 2000. But while Trump has recently expressed his skepticism of President Obama's ability to win re-election in 2012 , the real estate mogul is not without his own potentially damaging political troubles: just last Friday, Trump business partner Tevfik Arif was arrested on charges related to prostitution, human trafficking and organizing a criminal gang, the New York Daily News reports.